Weather.com forecasted highs in the upper 80s. Weather.com was wrong! Painfully wrong. 105 most certainly does not qualify as the high 80’s, especially when you are tent camping. Not that it came as a shock that Death Valley would be hot. After all, it does hold the record for the hottest temperature ever recorded: 134 degrees on July 10, 1913. I quickly realized why the high season in Death Valley was November through March. April was, most definitely, pushing it. After a night of trying my best to sleep through the heat (my kids, luckily, didn’t seem to be bothered by the fact that it was 91 at midnight), we woke up grateful to find cloud cover had cooled down the Valley. A friend had suggested that we leave our exploring for before noon and near sunset, occupying our afternoons at the swimming pool at Furnace Creek Ranch. We followed that great advice and the cloud cover (though our car thermometer said temps were in the 90s it certainly didn’t feel like it) made our hikes actually quite enjoyable. Do I suggest camping in Death Valley in April? No! But I do suggest that your family does visit this remarkable National Park in the cool season because there is so much to see and do. 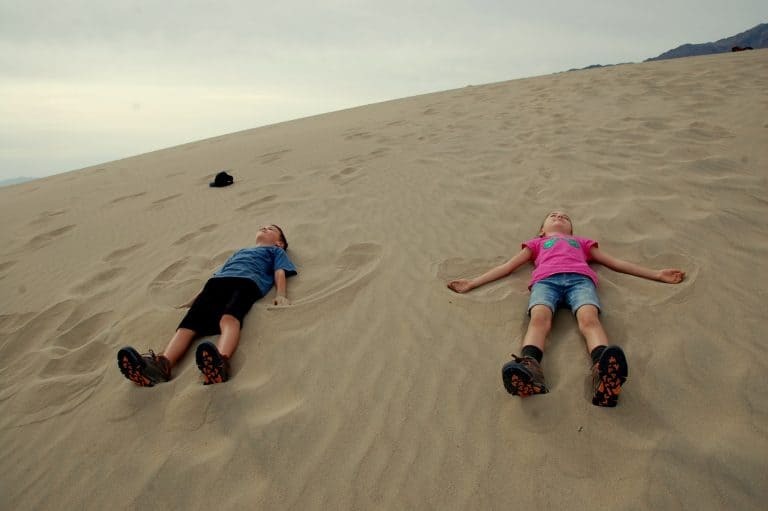 Here are some of Trekaroo’s top picks for the best things to do in Death Valley with kids. 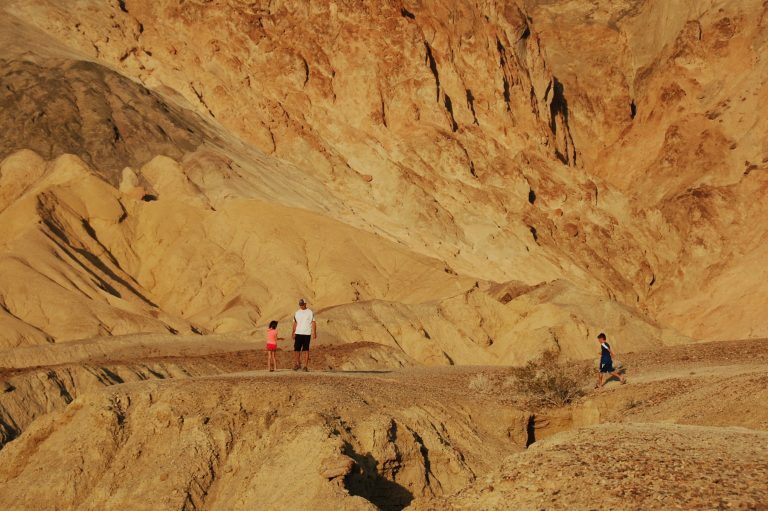 Furnace Creek is Death Valley’s main hub so expect trails and points of interest to most crowded in this part of the park. Here you will find several great places for families to explore as well as the bulk of the park’s lodging, camping, and restaurants. Most people stop at this overlook as they are driving into the park from its east entrance. A short walk up the hill from the parking area results is colorful views of the surrounding badlands. As with most things in Death Valley, the sunrise and sunset light really makes this place come alive. Hike through a multi-hued, high-walled canyon and choose from distance options ranging from a one mile out and back excursion to a four mile loop. 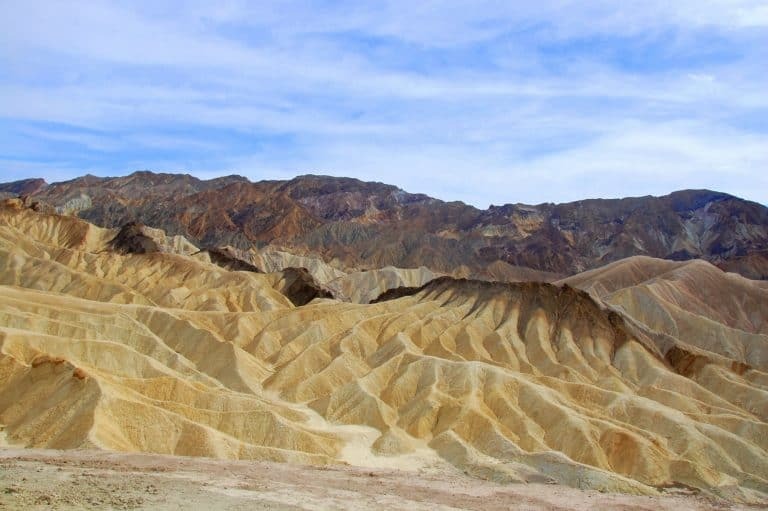 Another option is to take the trail from Golden Canyon to Zabriskie Point. Keep an eye out for abandoned mines along the way. I did see a couple people pushing strollers on the hard packed dirt but expect to do a bit of maneuvering in some spots. Part of the fun of Death Valley for my family was that we could head off trail (anywhere in the park!) and climb through all sorts of slot canyons. Bring your camera on this nine-mile paved, one-way road; it is fun to drive in the late afternoon when the light is soft and the colors of the mountains seem to glow. Halfway along the drive there is a parking lot. Stop there and get out to explore the colorful canyon and wash highlighted by greens, reds, oranges, and browns sprinkled through the dirt walls. Star Wars fans may enjoy imagining R2D2 searching for Obi-Wan Kenobi in the scene that was filmed here for the original Star Wars. 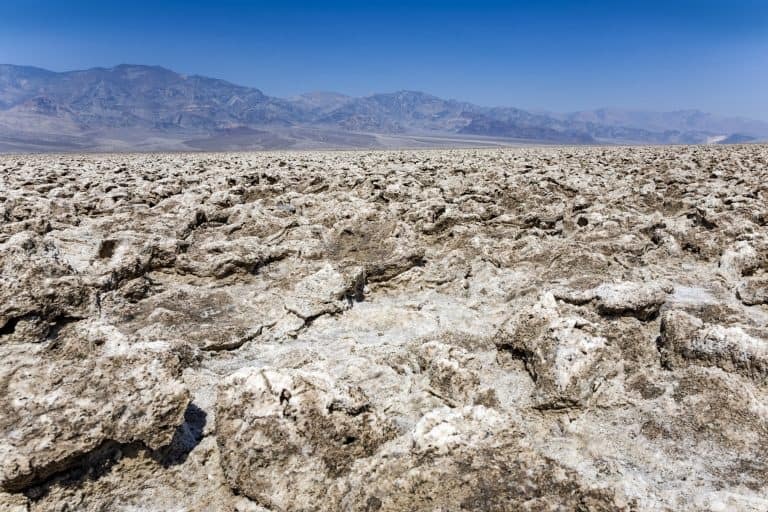 Evidence of Death Valley’s former existence as an inland sea is extremely evident here. An huge expanse of rock salt eroded into jagged spires results in a landscape like none I had ever seen before. 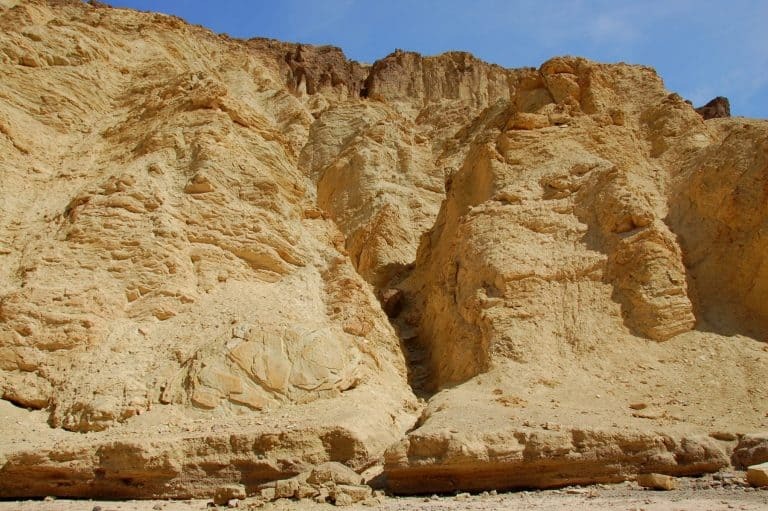 It is fun to trek out a bit onto this unusual landscape but be extra careful not to fall because nobody wants a cut full of salt! 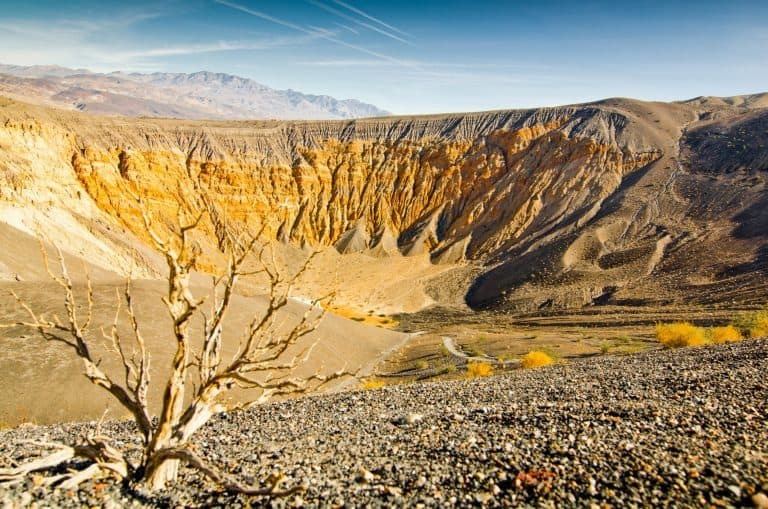 This is what everyone comes to Death Valley to see; the lowest point in North America at -282 feet, impressively offset by Telescope Peak looming 11,331 feet above just 15 miles away. This is where the hottest day was truly at its hottest. Visitors can walk out onto the salt flats and marvel at the small spring which gives the locale its name. Of course, the obligatory family picture next to the “lowest point” sign is a requirement. Exploring the windy, curvy, and narrow slot canyons are the reward of a 2-mile hike up Sidewinder Canyon. 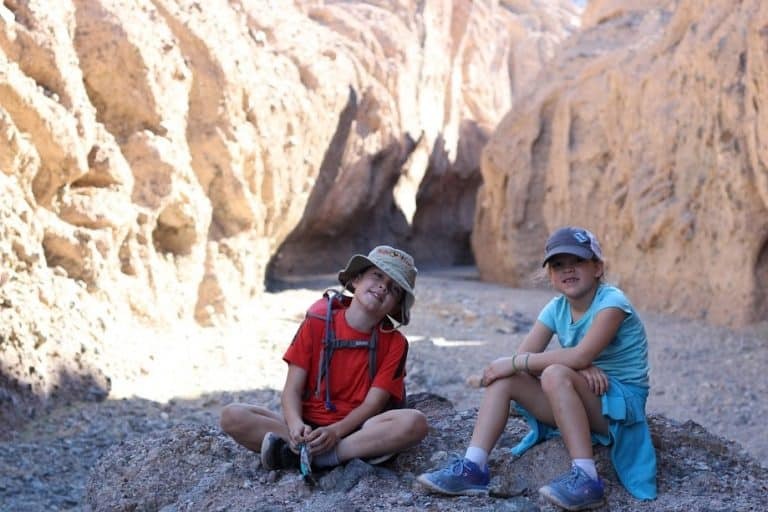 Families with teens and older kids should put this hike on their “must-do list” for Death Valley. The canyon slopes up from the parking lot with at least 3 narrow slots to explore off of the main wash. The walls may be touchable by a hand on each side and the light shining down through the slot will show in different tones and are absolutely a delight to explore. Get a map from the visitor center before taking the unmarked hike. Stovepipe Wells is about 30 minutes from Furnace Creek. There is a general store, restaurant, and some lodging/camping options. It is also a fun place to explore and with significantly fewer people than Furnace Creek. You will find these sand dunes beside the road just before Stovepipe Wells. While they are not the largest dunes in Death Valley- that title goes to the Eureka Sand Dunes which requires a 2.5 hour drive down a dirt road from Scotty’s Castle- they are the most accessible and very still very impressive. There are no trails so just head on out and start climbing. We saw a group of boy scouts snowboarding on the sand and it looked like a blast! Boogie boards may also work on the dunes although we found out the hard way that cardboard does not. Running down the sandy hills may be the biggest thrill. 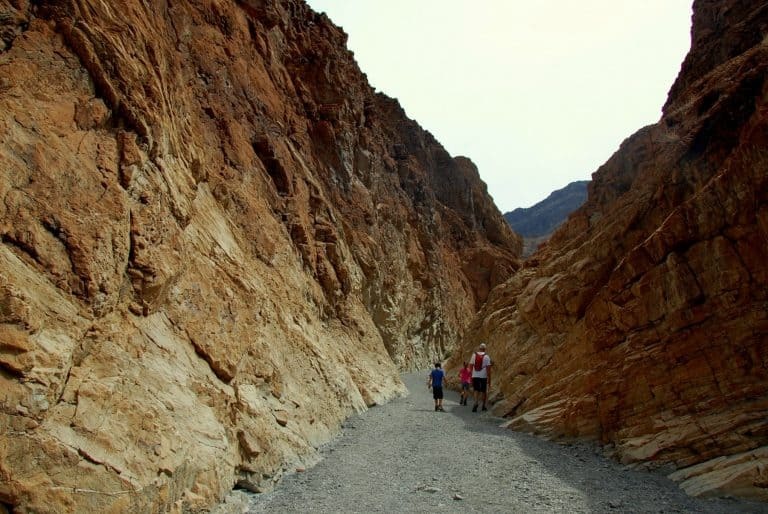 A short gravel road (fine for all cars) just outside of Stovepipe Wells leads to Mosaic Canyon, our favorite place to hike in Death Valley. The walls of this canyon look like polished marble in many places and the opportunities to climb, scramble, and spot wildflowers are abundant. Bighorn sheep are sometimes spotted in the canyon. The canyon is about two miles deep but since this is an out-and-back trail, you can make your hike as long as you would like. We opted to climb straight up the side of the mountain on our way back, giving us amazing views of the Stovepipe Wells area. 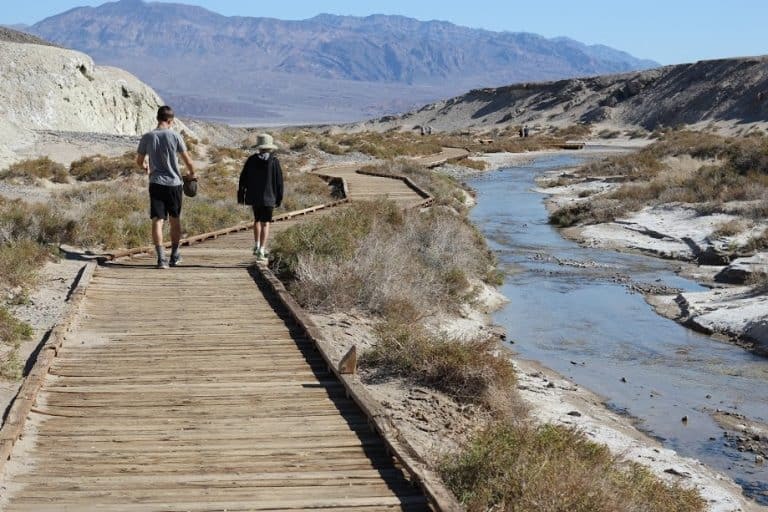 About halfway between Furnace Creek and Stovepipe Wells you will find the turnoff for Salt Creek, home to an extremely rare species of pupfish that survives in a salty and warm (up to 90 degrees in the summer) creek. The fish are most active in the spring when they are busy mating. A 1/2 mile boardwalk runs alongside the side of the creek, making it easy to spot the fish. Note: During a major flash flood in October of 2015, several buildings at Scotty’s Castle were filled with mud and roads were washed away. Repairs to buildings, roads, and infrastructure are taking place and hopefully, the area will be open to visitors again in 2020. This 660 foot deep crater along the road to Scotty’s Castle is the result of a volcanic explosion a couple hundred years ago. While the crater is visible from the road, it is also possible to hike along the crater rim. The park is huge! 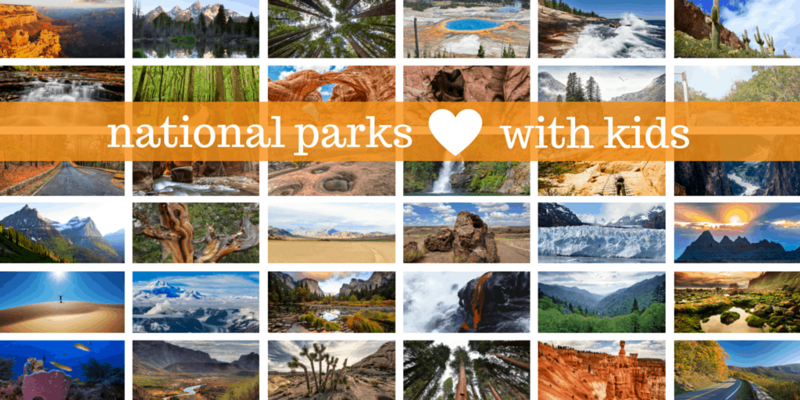 As a matter of fact, it is the largest National Park in the lower 48. Vegas is the closest major city, about 2 1/2 hours a way. A car is necessary for exploring this park. Gas is available at Furnace Creek and Stovepipe Well. 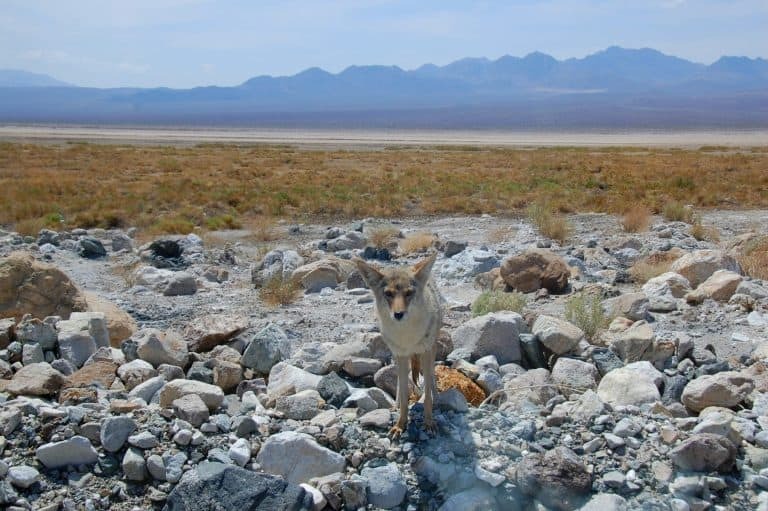 Prices reflect this remote location but is cheaper in Stovepipe Wells than Furnace Creek. Head to the park Visitor Center in Furnace Creek first. This is where you can pay your park fees, pick up a Junior Ranger booklet, ask park rangers questions, and explore several interactive exhibits. If the weather is warm (and it usually is) opt to hike during the morning and early evening, leaving the middle of the day for pool time or some quality time in air conditioning. Remember, almost the entire park is listed as wilderness so free to explore off trail as much as you would like. When heading out on a hike, always wear hiking shoes (the dry dirt and gravel can be quite slippery), and bring sunscreen, lip balm, and plenty of water. A hat with a brim is crucial to protect you from the heat and wind.The air is very dry in Death Valley so you will likely find yourself more parched than normal. We recommend packing a cooler full of groceries and bringing it with you to Death Valley. General Stores do have some basic food supplies but prices are at a premium. If you opt to camp, be sure to head over to Furnace Creek Ranch and purchase a shower/pool pass. The pass is just $5 per person per day and worth its weight in gold after a morning of dusty and hot hiking. The pool is fed by a warm, underground spring as is the nearby golf course. Ice is worth its weight in gold at Death Valley. If you find yourself needing ice, purchase it at the general store in Stovepipe Wells. They charge almost $6.00 for a small bag of ice at the Furnace Creek Ranch General Store! Firewood is also significantly cheaper in Stovepipe Wells. Keep your eyes out for coyotes while driving. Park visitors have obviously been feeding the coyotes because they will fearlessly run towards your car in search of a handout. We had one approach the car about 30 miles south of Badwater while I was going 45 miles per hour. Yes, he was adorable as he sat about 10 feet from our car with his most charming look, but I can’t help but worry that his life will be cut short by a driver who isn’t paying attention. DON’T EVER FEED WILDLIFE! 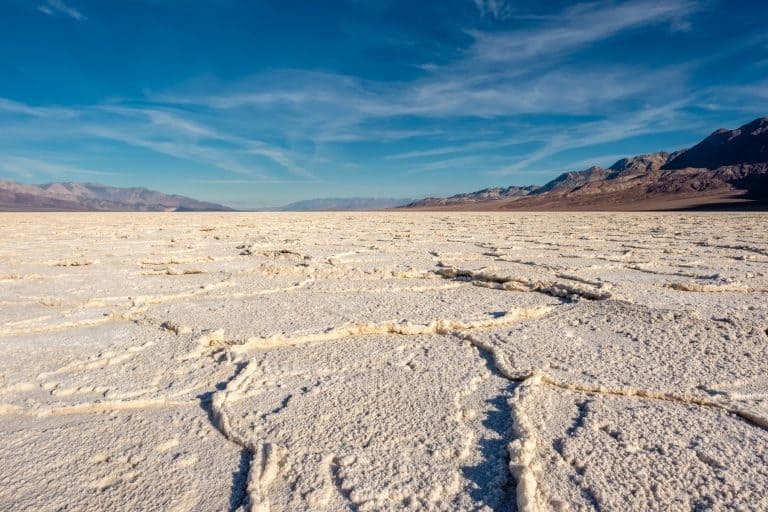 Mining played an important part in Death Valley’s history, especially borax mining. Evidence of this history can be found at a museum at Furnace Creek Ranch, at the Harmony Borax Works near Furnace Creek, and several abandoned mines throughout the park. Spring wildflowers are like little miracles in Death Valley. They sprout up out of rocky crevasses surrounded by ground that seems entirely unsuitable for maintaining life. We saw the most wildflowers in a mountain pass near the park’s southern entrance. 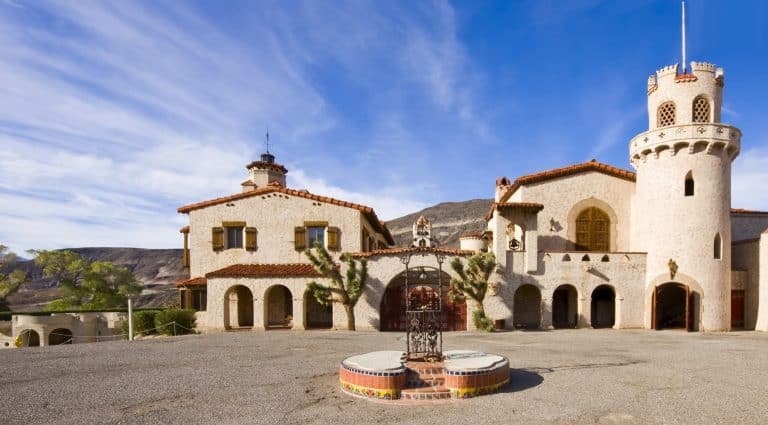 If you are looking for lodging, the Furnace Creek Ranch is really a great place for families. There are plenty of activities on sight- shuffleboard, swimming, horseback rides, bocce, and golf to name a few- and the price is not nearly as high as the upscale Inn at Furnace Creek. Plus there a few dining options on the property and the park visitor center is just steps away. The night is a great time to enjoy Death Valley. Stars are abundant and the Milky Way is visible. If a full moon is present, consider heading to the sand dunes for some moonlit exploration.